This is the amount of units that is included with the item. I personally like this product because it is small, easy to install and has blue illumination and doesn't appear dated in style like the others on the market. Easy and quick install. Easy to calibrate and also super accurate!! I replaced one from scosche and as soon as I did I noticed how much voltage drop I was getting, where with the cheaper meter wasn't so responsive I didn't notice. I would recommend this Stinger SVMB volt meter for anyone wishing to accurately measure their voltage under any kind of load. Thanks again SonicElectronix for such a great value! I've got this wired to my amp to monitor voltage but I'm replacing it with the SMD VM-1 because it's a lot more accurate than the SVMB.. I have no complaints about this SVMB really other than with any digital volt meter it is going to have some lag on the readings with it. I'm going to switch it over to my battery power to monitor my XS D3400 and D1200. First off the meter does work and perform to par expectations. Although many people over the internet and myself included have been having the problem of the meter not responding, which ends in disconnecting the wires and reconnecting them. Simple fix, yet an irritating issue. It happens almost once a week and has me considering selling mine. Fair warned. I bought two of these and can't be any happier with them. There really bright, but I have mine it the trunk so no big deal. Easy to use and it has a nice look to them. It is quite small so it's easy to find a good area to place it and it looks good too. I have 3 cars & have 1 in each car. They all work great & look really cool. The extra features(calabrion, extra power on/ off wire) are very good because other meters don't have these features. I am very happy with this volt meter. It's worth the extra cost over many of the cheaper ones. 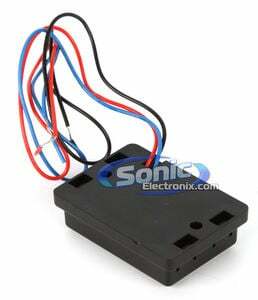 It has a variable adjuster to adjust the voltage to the correct reading and has a remote turn on wire. If you do plan to use this in your dash, it is blindingly bright at night, don't even think about it without some form of modification. Personally, I purchased both the red and blue version. I put the blue in my dash and the red in my trunk. At night I put the red faceplate on the blue screen and it dims it down to perfect brightness. Highly recommended, verrry bright at night is the only drawback but easy install and great product! For the most part very accurate(-.1 or .2V) Love Stinger products! This is a great voltmeter. Very bright and readable. The illuminated stinger logo makes this thing brighter. I particularly like the ability to adjust the voltmeter adding to its accuracy. Had to add a switch to it because it's way to bright to keep on all the time. Make sure to get this one with the extra power on lead.... the cheaper version stays lit all the time and is pointless. Works great.Comes with a really sticky back part for instant mounting. i ran a switch between the red(hot)wire and the battery so i can turn it on and off. Super bright display. This a great product. Its easy to set up, easy to mount, and easy to see. All for a great price. This would be a great addition to any system. A inexpensive way to make sure you don't damage your amp from low voltage. I'm currently using one of this items and it's just so great. I don't have to constantly open the hood of my car to see the current battery voltage. I got this to be able to monitor the volts of my second battery and it works perfect and looks incredible. Makes the front of the car really stand out. Cant say for the durability because I have only had it 10 hours but I don't expect any problems. 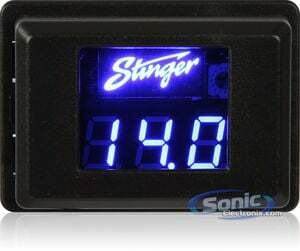 Thanks Sonic Electronix and Stinger for such a great product at such an incredible price. Easy to install, super bright, matches my LEDs. This thing works great & is really easy to set up & adjust. JUST WHAT THE INSTALL DOCTOR ORDERED!!! This is a must have! Your factory voltage gauge lags soo bad that by the time your voltage has dropped its too damn late. This product is very very easy to install, and I did not need to adjust it at all, they got it bang on. What are you waiting for? Stop guessing what your actual voltage is, and do the damn thang. SE is the best bar none! Nice volt meter for the price. Does the job it intended for. Its a good meter. The light on this unit is super bright though. I wish it was adjustable. Id say it is actually blinding to look at during the night. I have this in the round red version which also works well but that one is not as bright. I like the blue color. You need a multimeter to adjust it to ensure its reading accurately. I looked a several voltage meters before going with this one. This digital meter is super easy to tie into my system, but looks great with the blue display and is accurate from what I can tell. Stingers makes a great product abd I am glad I went this route. I Am Very Pleased With Your Product. Would Definitely Recomend.